A Sam Houston State University researcher who has studied bighorn sheep for more than 30 years is assisting in the solution of a ticklish endangered species disagreement in California. 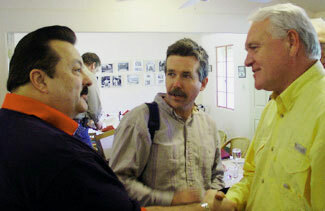 From left, SHSU bighorn sheep researcher Jack Turner, colleague Rob Roy Ramey, and Steve Griles, deputy secretary of the Department of the Interior. Jack Turner, associate professor of biology, met recently in Palm Springs, Cal., with a group that included Steve Griles, deputy secretary of the Department of the Interior, as well as area politicians and representatives of recreation organizations. The controversy was sparked by the designation by the United States Fish and Wildlife Service of 845,000 acres some 100 miles southeast of Los Angeles as critical habitat for approximately 350 Peninsular Bighorn Sheep. The sheep are so named because they live in six mountain ranges collectively known as the Peninsular Mountain Range. The eastern edge of this area includes portions of the cities of Palm Springs, Cathedral City, Rancho Mirage and others. Officials of those cities say that although they support the preservation of species such as bighorn sheep, which have been protected in California since the mid-1800s, they believe the area designated hinders the growth of their cities. Groups such as the Desert Trail riders also disagree with the recent closure of parts of the six mountain ranges to all forms of backcountry recreation, including hiking, biking, and horseback riding. Some of the trails have been used for 50 years or more, and are on both public and private land. Turner and three other researchers, including Rob Roy Ramey, chair of the zoology department at the Denver Museum of Nature and Science, analyzed a portion of the designated critical habitat and concluded that it may contain more acreage than necessary. "The United Fish and Wildlife Service has designated lands that are neither currently nor historically occupied by bighorn sheep," said Turner. "Further, the land fails to provide adequate essential or critical habitat required for bighorn sheep to exist." While unable to examine all of the 845,000 acres, Turner and his group analyzed part of one mountain range, the Santa Rosa Mountains, to reach their conclusions. 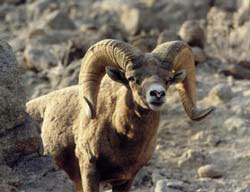 "The results suggest that the designated habitat includes some areas of importance to bighorn sheep," said Turner. "But there are large landscapes that do not appear to be used." Turner estimates that the area unoccupied by the sheep is 66-85 percent of the designated area, and lacks features necessary for conservation of the species. Turner believes that the Fish and Wildlife Service used an unscientific "model" to determine the protected area, based on data which they will not reveal. Research by Ramey also disputes the contention by the Fish and Wildlife Service that the Peninsular Bighorn Sheep is a unique subspecies. He believes the sheep are more accurately designated as Nelsons Bighorn Sheep, which are plentiful enough to allow their recreational hunting in the western and southwestern United States and Mexico. Turner expects the issue to be settled in court if the Fish and Wildlife Service does not take action on its own. Litigation has already been filed in the 5th Circuit Court, but those who filed it have agreed to give the government agency time to reconsider its approach. Critical habitat designation for the Peninsular Bighorn Sheep, or Nelsons Bighorn Sheep if you use Ramey's taxonomy classification, is not the only such controversy which has landed in the courts. Designations for the Arroyo toad, Red-legged Frog, Steelhead and northern salmonids, pygmy owl, and others, have also been overturned. Turner said he is not concerned with which side of the issue his research process supports, but believes the process is unique and could be used in the process of determining future critical habitat designations. "This approach has the potential to set a model for establishing a new level of scientific integrity in the Federal Endangered Species Act process throughout the nation," said Turner. "It could pave the way for a more scientific and professional approach to endangered species protection, conservation, and implementation throughout the United States."